What is the MSI Energy Program? Smoother, quieter operation. Longer pump life. Longer life, lower maintenance costs. Do you really need the MSI Energy Program? "The study of friction, lubrication and wear has long been of both technical and practical interest, since the functioning of many mechanical systems depends on friction and wear values. This field, recently dubbed 'tribology,' has received increasing attention as it has become evident that the waste of resources resulting from high friction and wear is very great (more than 6% of the Gross National Product), and that the potential savings offered by improved tribological knowledge are correspondingly great. Unfortunately, the background of most engineers in this important area is seriously deficient. For example, the average mechanical engineer has had wear as part of his/her university studies. To compound the problem, coverage of tribology in most reference works is insufficient or outdated and provides little guidance to those involved in new situations..."
Viewing a "smooth" metal surface under a microscope revels a field of peaks and valleys. Those uneven edges rub together, grinding away the surface of moving parts and causing a loss of power, excess heat, and increased metal stress. MSI boundary layer metal treatments- represented in the darkest blue-fill those peaks and valleys to all but eliminate friction. Real contact area is effectively increased and permanently lubricated, making conventional lubrication much more effective. High-performance oil company's test laboratory showed a 4.6% reduction in brake specific fuel consumption after MSI metal treatment was applied. For the actual results, click on: BSFC (Brake Specific Fuel Consumption). Why Are Water and Heat a Problem? WATER: has long been known to be a major cause of metal fatigue and failure in machines that require a fluid system for lubrication and cooling of gears, bearings, slides, and hydraulics. Even minute amounts of water can contaminate lubricants. HEAT: accelerates oxidation in conventional oil and grease, leading to the formation of gum, sludge, and varnishes. This in turn, increases operating temperatures, accelerates deterioration of lubricant additives and escalates energy requirements. Heat also increases the amount of water formed by condensation. WATER: from condensation or from leaking seals, machining coolant over spray, or flooding, can penetrate through conventional lubricants. This can cause contamination and breakdown of the lubricant and can form a corrosive wedge at areas of stress, leading to fatigue and failure. MSI's Patented Metal Treatment Process reduces heat generation, dramatically lowering energy requirements. The unique surface filming action of MSI's Patented Metal Treatment Process seals the metal matrix from water and other chemical penetration. The same unique surface film which rejects water penetration also increases the fatigue resistance of metals. Condensation = Water (H2O) Penetration of Lube. H2O Enters Lube and Changes to H + (OH). (OH) Combines with Contaminants and Lube Additives Causing Lubricant Breakdown. 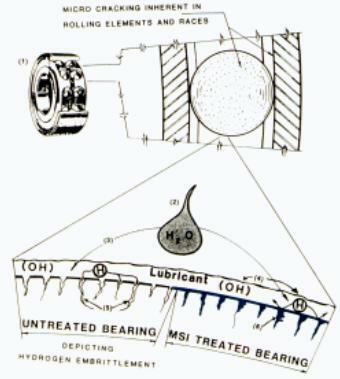 H continues through lubricant to areas of stress on bearing, acting as a corrosive "wedge" between the bearing metal molecules leading to fatigue and failure. For information on becoming a distributor or if you would like to try MSI’s products, call MSI at (419) 599-7010 or by E-mail at MSI@Bright.net.